Just had a phone call with a random Swede – There’s a US number that you can call so it’s not long distance. 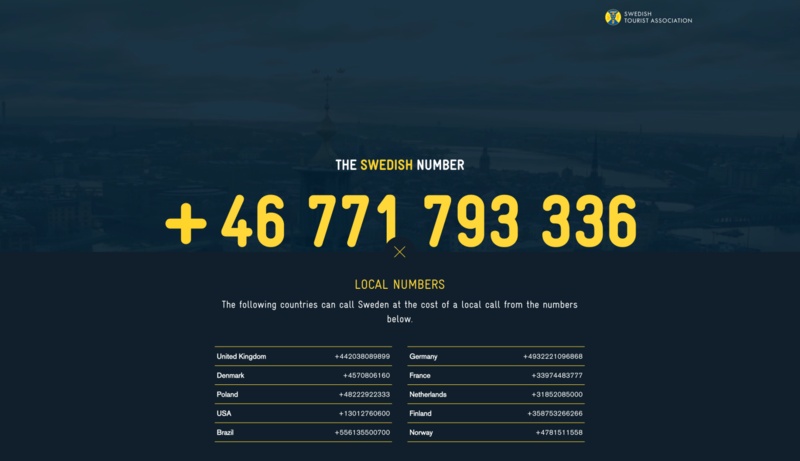 It’s a hotline run by the Swedish tourism bureau where you can reach a multilingual Swedish volunteer – one of 2,500 – who are available 24/7 to answer any question you’ve got. It can be about Sweden or anything else. You guys, this is an awesome idea. We talked about winter sports, how to say Henrik Zetterberg’s home town (Njurunda), and I learned that reindeer racing is NOT a widely popular sport, contrary to what Steven Van Zandt in Lillyhammer would have you believe. We also talked about international politics – this fella has had numerous conversations with #FeelTheBern, #ImWithHer and #Trump supporters and had some interesting externally-derived insight. He also knew that Luke Wilson and Maya Rudolph played the lead roles in Idiocracy. What a cool idea. It doesn’t matter what side of a border you are on, there is probably a politician exploiting the communication barriers that distance and language pose. They dehumanize the ‘other’ people ‘over there’ so that they can ‘protect’ you from this dangerous outside influence. Imagine if we had a hotline where people could call up a random family in Tehran or a random refugee family that just hopped a boat to Greece. People on each end of the line would be able to call each other and cut through the jingoism and craziness. Chances are, they’d realize they have more in common with the person on the other end of the line than they do with their own elected leaders. I had the amazing opportunity to travel with an orchestra to France, Germany, Belgium and Holland in 2003 (Yep, spoiled rotten). That trip – at the height of the pro-war rhetoric – continues to color and complicate my worldview. On our side of the pond, there was no question that WMDs were being shuffled around Iraq. On their side of the pond, there was a feeling of helplessness as the most powerful nation in the world was about to invade a country under false pretenses and there was nothing anyone could do to stop us. I have that same feeling of introspective cognitive dissonance I had when traveling, except it came from a 15-minute phone call on a lunch break instead of a two month trip. Now that I’m an adult with hungry student loans to support, I realize that world travel isn’t practical for everyone. But perspective and humanity should be for everyone. Call the line, talk to a Swede, tell a friend.